One of the things I have learned about myself and programming is that if I don't write it down, I stress about it. The longer I wait to write it down, the more I stress out. Listing it out makes me feel better about things in many ways--small steps, deadlines, breaking up tasks etc. So I've created a program planning method that is basically a glorified to-do list. 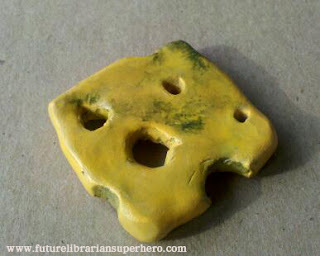 Did I need to hand-craft moldy cheese for my D.o.a.W.K party? No, but the kids were super impressed by its grossness and I enjoyed making it, cackling to myself all the while. I try really hard to take an "Unprogramming" perspective and not spend more time planning than a program is worth, but it's a learned process for me (someone who would love to be a perfectionist party planner in another life). Smash things--smash out bullying. Create first? Write? This work is incidental--by the time I get to crunch time (about a week before I actually do the program), I've only spent 5-10 minutes on it so far. Full disclosure, at this point I'm also starting to feel like this about the program. Then, I take a half-hour or so and make myself a program outline. 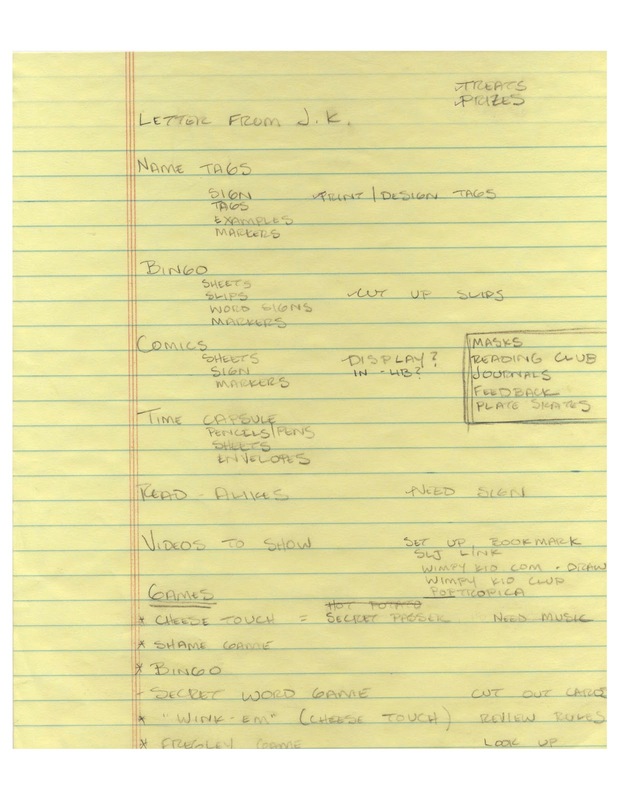 I write down all the things I *want* to do for the program, and below that I write down all things I need for each activity--purchased, gathered, or created. Then I take a realistic look at what's feasible, what's too much effort, what's just blatantly over-doing it, and decide what my program will actually look like. For me, it's totally crucial to see the whole thing laid out in black and white, so to speak. On the day of the program, I can just consult my list to gather all my materials and set everything up, and I'm good to go. I think I've hit a nice balance between my perfectionism/desire to create the BEST.PROGRAM.EVER and keeping myself sane and being a good steward of my own time. I'm the same way. Sometimes I'll remember something or have an idea in the middle of the night and if I don't write id down, I'll never get back to sleep. I keep a to-do list and a program outline. Depending on how large the program is, a timeline checklist leading up to the event. I have some programs that need this type of elaborate detail and ones that I jot down a couple phrases and I'm good to go. It's comforting to know I'm not the only lister out there. It's just how I get 'er done!